JT Barber , 18, who marched in the snare line with the 2004 Blue Stars (and will be returning for the 2005 season), submitted this one. 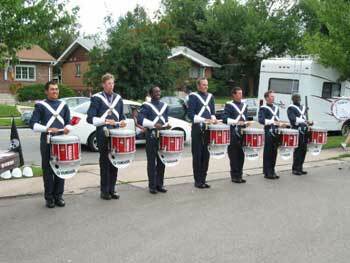 "This picture I sent it is of the 2004 Blue Stars snare line right after Division II & III Grand Finals retreat. The drum line played our entire show from start to finish for one last time before we got on the bus and headed for Division I finals. The members of the snare line are (from left to right) Me, Vegas (ageout), Bruce, Jake, Dan, Andrew (Dussl), and Alex (Kit-kat). It was a great year and I will miss all these guys -- and I am sad that I would never be able to play with the same six people again. Thanks for a great year!" Thanks JT!